Not even the intense, sticky, morning heat could keep this cute couple from tying the knot outdoors in the presence of family and loved ones. 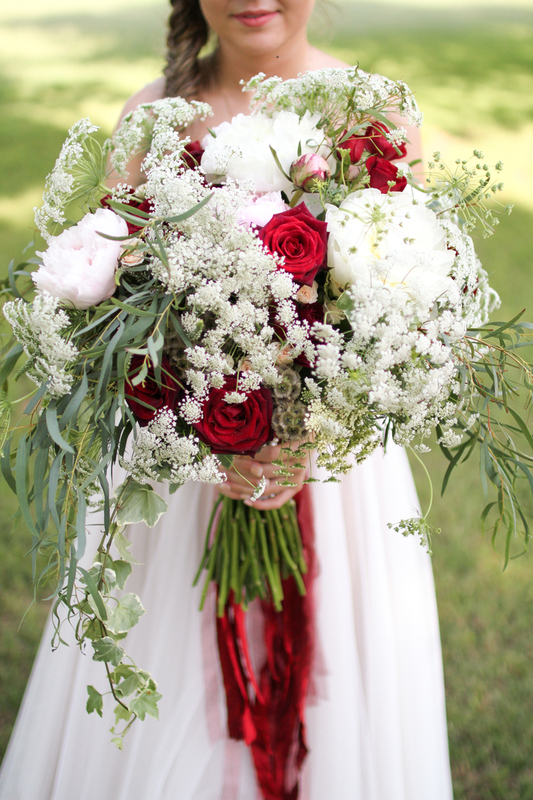 Christine loved the idea of deep red accents with ivory flowers, so Black Baccara roses dotted her bouquet along with ivory and pink Peony, Queen Anne’s Lace, Scabiosa Pods, and oodles of ribbon streamers. The ceremony took place underneath a copse of Texas Pecan Trees in an open field, lovingly conditioned by friends & family in this lovely farming community. Ivory & champagne tulle were draped across the branches to create a focal area where they exchanged their vows. The bridesmaids carried simple Hydrangea & Baby’s Breath bouquets. Photos were taken by Kristi Soto. 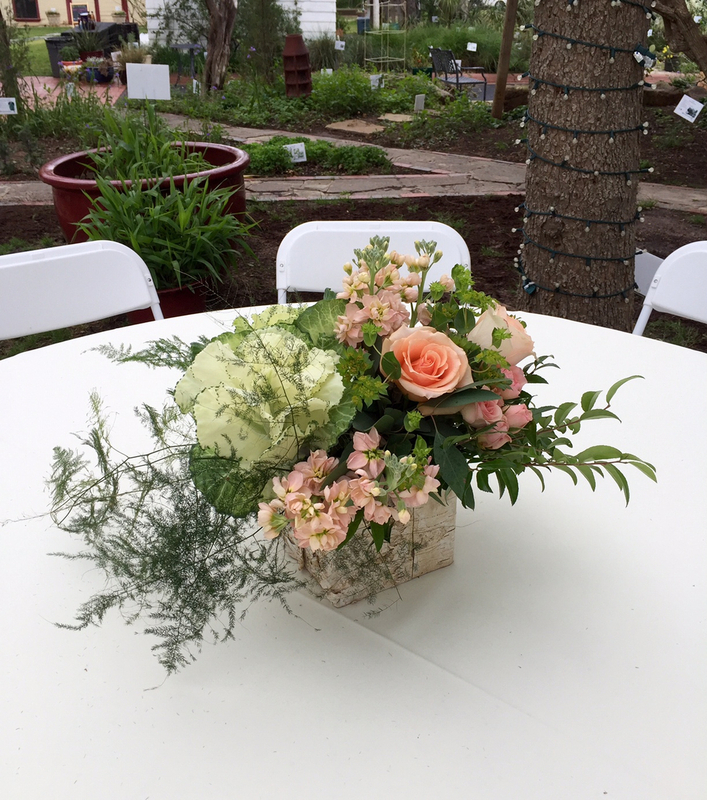 What a lovely day for a lovely couple – Laughing Earth Flowers was honored to have been part of this beautiful celebration of love! Deborah and Bridgett’s warmth and generosity truly inspired me, as did their excitement to finally be able to share their love with friends and family in a beautifully intimate wedding ceremony. Wine and fine food has always been an important part of their relationship, so these touches were incorporated into the floral arrangements for this ceremony & reception held at the Classic Cafe in Roanoke. 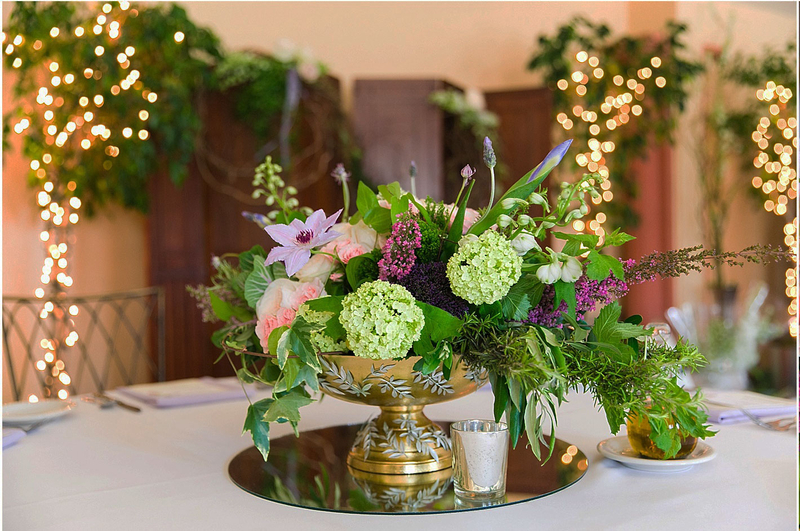 We wanted to bring a bit of Deborah’s English garden to Texas, so we used a lovely mix of Clematis, Grapes, David Austin Garden roses, Kale, Rosemary, English Ivy, Viburnum, Iris, and (of course!) Heather – that tiny, romantic flower that grows freely across the English moors. (For all you lovers of Wuthering Heights – “I cannot live without my life! I cannot live without my soul!”) A special thanks to Angela & Jenny at New Seasons Photography for the fantastic photos. Check out the full gallery at New Seasons Photography. It was a lovely day, a bit windy, but all was well in this contemporary urban setting in downtown Ft. Worth. Leanne and Joel were surrounded by their loved ones as they dedicated their lives to each other in a simple, elegant ceremony. Leanne chose mint and ivory as her colors, and the bridesmaids wore dresses in the mint color family. The bouquets were contemporary to suit the couple and the venue, with lots of Carnations, Roses, Dendrobium Orchids, and lots of greenery. Photographer: Luigi Mrooff of MRoof Photography. As much as I love bright colors, I can’t help but be a bit nostalgic when I work in whites. 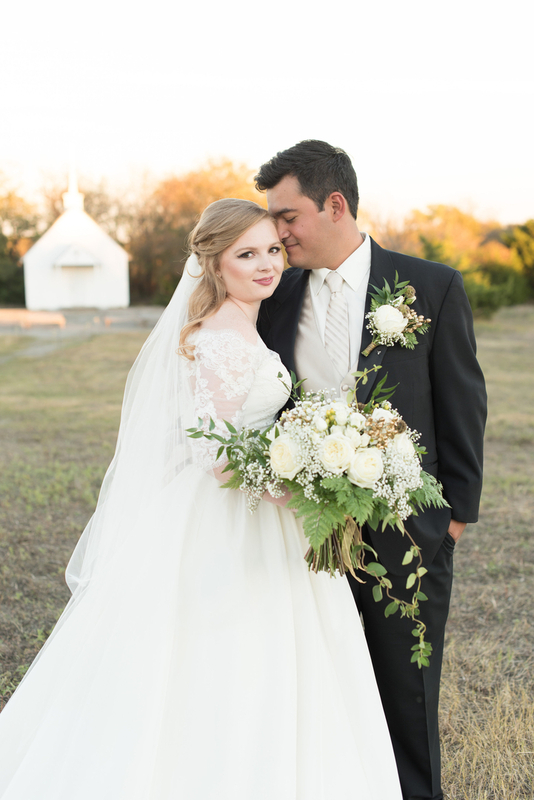 Lauren wanted neutral ivory with little punches of gold and burgundy, and it turned out to be the perfect complement to the quaint setting of Cowboy Hall at the Big Orange Pumpkin Farm in Celina, Texas. As is often the case in the weather was unpredictable, but after a brief shower during the morning, the skies brightened and hearts were light as friends and family gathered to celebrate the union of Lauren and Pedro. I was particularly touched by the very heartfelt emotion displayed by Lauren’s father as the time approached for him to watch his sweet girl marry this wonderful young man. For Lauren & Pedro’s special day, I went to one of my favorites – the Polo rose; but I could not help but add David Austin’s magnificent garden rose, Patience, to her bouquet. 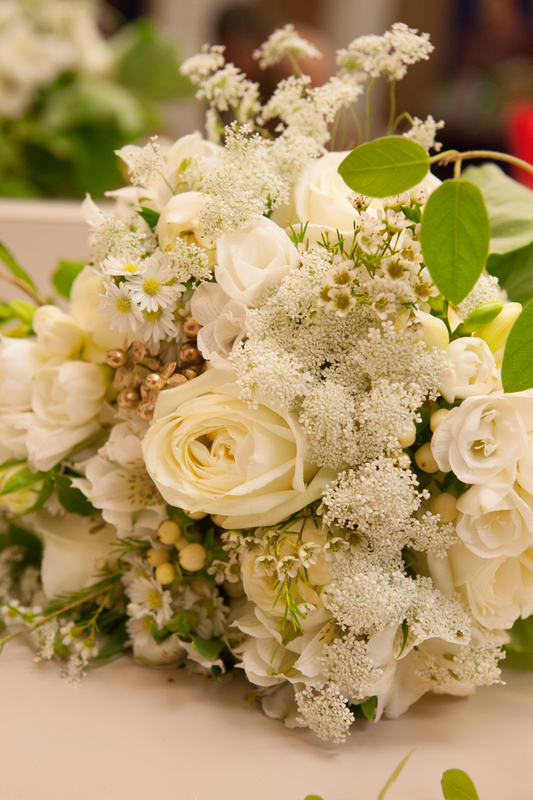 The fluffy petals and yummy fragrance added the perfect touch to this ivory beauty. The bouquet was finished out with gold and ivory Hypericum berries, neutral Scabiosa Pods, spray roses, Baby’s Breath, Cleopatra Fern, and delicate Honeysuckle vine. For the bridesmaids, Lauren wanted burgundy Hypericum to complement their burgundy dresses. The boutonnieres for the men were all wrapped with gold bullion wire, adding to the “rustic” feel of this dreamy white wedding. 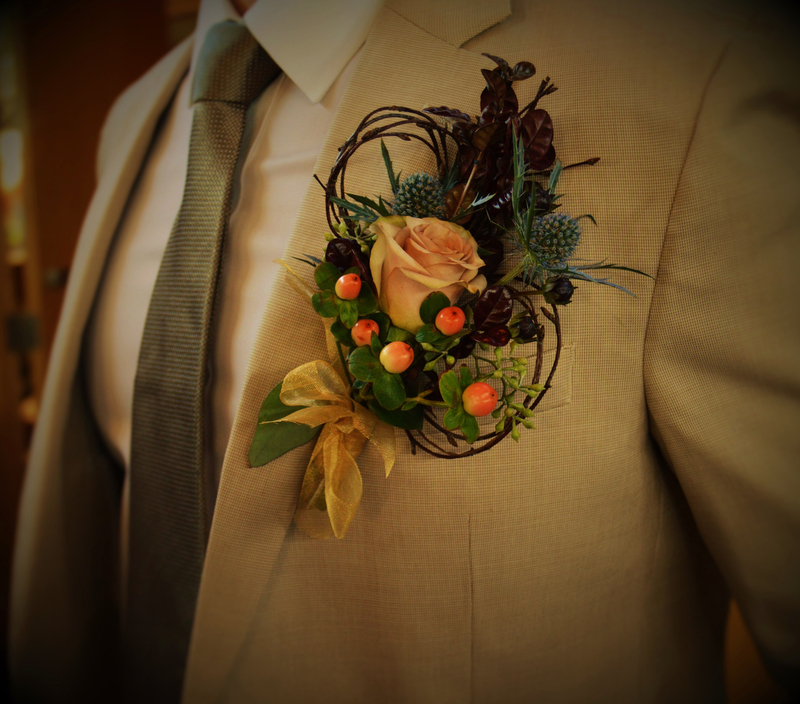 Laughing Earth Flowers would also like to thank Lori Lynn Photography for these outstanding floral photos. 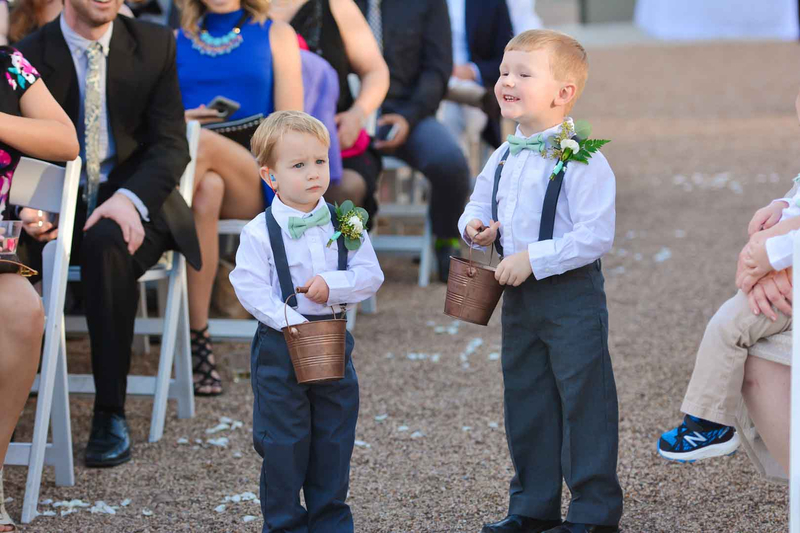 Additional pictures of this wedding can be found at Lori Lynn Photography. Meeting Sandy for the first time was like greeting the sunshine! She is one of those people that truly brightens the room with her open smile and her caring personality. This wedding was the biggest I have done to date – ten attendants, many family members and friends. The day started off with a morning of dark clouds and heavy rain, but the sun finally made an appearance and my assistant and I headed to the glorious Dallas Arboretum. Sandy chose this time of year because she has always loved the rich colors, and she also expressed a desire for the bouquets to be very free flowing, with lots of greenery. I could not help but think of the magnificent garden rose, Juliet, to be featured in her bouquet. The bridesmaids bouquets contained Sahara roses with Delphinium, Scabiosa pods, Hypericum berry, Seeded Eucalyptus, Lemon Leaf, and bronze Smokebush to complete the look. The reception featured their bouquets along with birch filled vases and bronze votive holders on blue table linens. It is always such a special pleasure when I have an opportunity to really get to know some really wonderful people, and meeting Natalie and her family was a special treat. Natalie chose ivory, coral, and gold as her color palette, and so I jumped at the chance to get to use one of my favorite roses…the aptly named “Wow” rose with its intense salmon shade was the perfect note for the other orange and ivory blossoms. I also used hypericum (some painted gold), Peruvian Lily (the groom is from Peru! ), Polo roses, garden spray roses, Asters, Queen Anne’s Lace, Honeysuckle vine, Clematis, and Peppermint Geranium. Photos are by Widyn Photography. When I first met Jennifer, she expressed how important it was that her love of wild flowers growing in the fields be reflected in the flowers chosen for her wedding – so we thought that her bouquets should include wild, spiky Thistle in contrast with the softness of Clematis, Lisianthus, Delphinium, Lilac, Hydrangea, and scented Geranium leaves. Ribbon treatment included delicate organdy, satin, and dupioni silk in shades of green and purple. 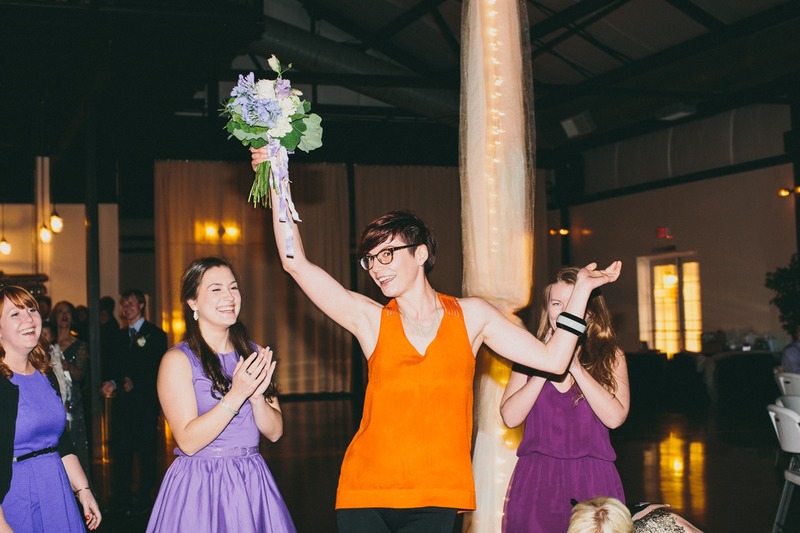 These lovely photos were taken by Caroline Fontenot.